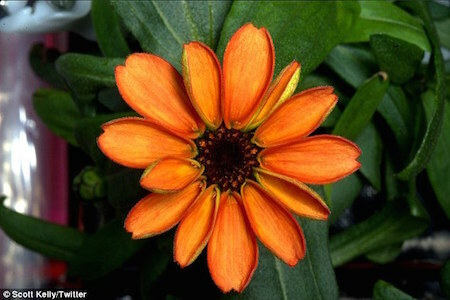 The first flower grown in space was revealed by the astronauts of the ISS. The flowers were grown inside the Veggie lab aboard ISS which was installed in early May 2014. While the ISS crew had previously raised two crops of romaine lettuce and arugula, the zinnias were the first flowering plants grown in space. Explaining the significance of successfully growing a plant, Veggie project manager Trent Smith said: 'The zinnia plant is very different from lettuce. Fans of Star Trek may recall that flower growth was a snap on the artificial gravity-equipped Enterprise. 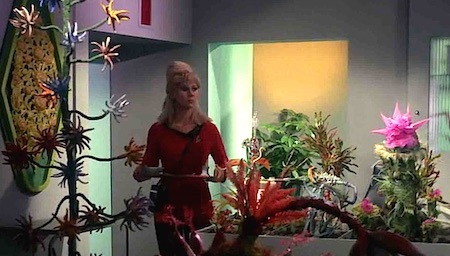 Yeoman Rand likes flowers. A lot.